Arsenal manager Arsene Wenger says the Premier League has the best attacking players in the world, as his side prepares for an "intense" north London derby at home to Tottenham on Saturday. The Gunners, third highest scorers this season with 10 goals, are fourth in the table, two points clear of Spurs. 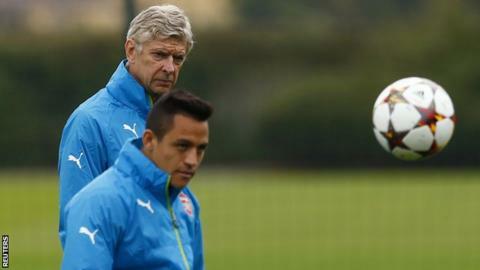 "We have all the best attacking players in the Premier League," Wenger said. "The clubs here have huge financial potential and offensive power. All the best players play here." Premier League clubs spent a record £835m this summer as Alexis Sanchez arrived at Arsenal, Manchester United signed Radamel Falcao on loan and Angel Di Maria in a British record £59.7m deal, Chelsea acquired Diego Costa and Liverpool purchased Mario Balotelli as replacement for Luis Suarez, last season's top scorer with 31 goals. Danny Welbeck also arrived at Arsenal in a £16m deal from Manchester United, and his first goal for the club helped secure a 3-0 victory over Aston Villa last Saturday. Both Sanchez and Welbeck could figure for Arsenal against Spurs in Saturday's late kick-off. "North London derbies are always very intense and the players from both sides know each other so well," added Wenger. "Over the years Tottenham have always had a good team and for us to be on top of them means we can fight for the top of the league. "These games are important moments in the season." Despite suffering their second defeat of the season against West Bromwich Albion last Sunday, three points for ninth-placed Tottenham would see them leapfrog Arsenal, whose win at Villa is their only victory in five matches across all competitions. Mauricio Pochettino, who led Southampton to an eighth-place finish in his first full season as a Premier League manager last year, acknowledged the importance of what will be his first game against the Gunners as Spurs manager. The Argentine, 42, also paid tribute to Wenger, whose 18 years at Arsenal makes him the current longest-serving manager in English football. "Tottenham for me is a big job, it's a dream to stay here and have the time Arsene had in Arsenal," he said. "For this, I need to show my skill, I need to work hard, I need to get the results. "We arrived three months ago and we need to make our way but we are focused on the game and know the history. But it is also important to write the history, starting now. "It's a derby. So you need to show all that you have inside."